← The Hobbit: The Battle of the Five Armies Enters The Oscar Race! 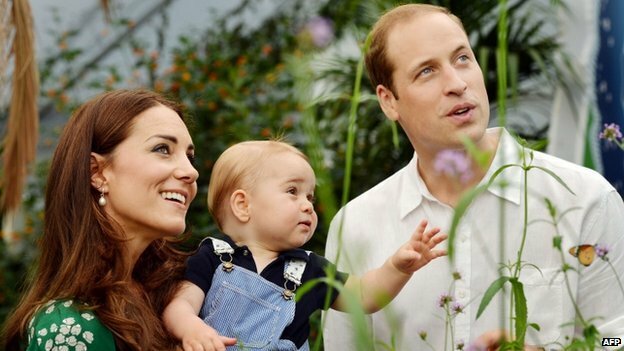 The Duke and Duchess of Cambridge Expecting Baby in April 2015! Kensington Palace confirmed today that Prince William and Catherine are expecting a baby in April 2015. Only six months till Prince George will have a little sibling to run around and play with! Another royal baby due in April! The Duchess continues to be affected by Hyperemisis Gravidarum, but her condition is steadily improving. Catherine suffered from the same severe morning sickness when she was carrying Prince George. Catherine is due to make her first public appearance on Tuesday since announcing her pregnancy in September. The Duke and Duchess of Cambridge will greet The President of the Republic of Singapore and Mrs Tony Tan Keng Yam on behalf of The Queen at the Royal Garden Hotel, London as part of the State Visit. Their Royal Highnesses will then travel with The President and Mrs Tan to Horse Guards Parade, where The President will receive a Ceremonial Welcome. The Duchess of Cambridge will also attend the Wildlife Photographer of The Year 2014 Awards Ceremony at the Natural History Museum on Tuesday 21st October. We do wish Catherine all the best! Congratulations to William and Catherine from The Anglophile Channel!